Sometimes you can get amazing results from just throwing something together at the last minute. This has never been more true in music than with all-girl pop group Fifth Harmony. Fifth Harmony originated as a thrown together group on the second season of the American singing competition show, The X Factor, in 2012. The group consisted of members Ally Brooke, Camila Cabello, Normani Kordei, Dinah Jane and Lauren Jauregui, and finished third on the show. They signed a deal with Epic Records, and have been recording and touring around the world ever since. “Miss Movin’ On” was the group’s debut single, and was released on July 16, 2013 as the lead single from their debut EP, Better Together. 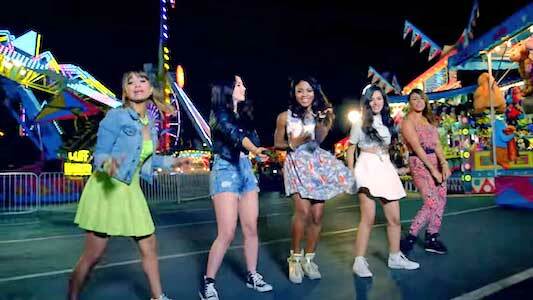 Fifth Harmony heads to the Del Mar Fairgrounds for the day. The song is a powerful pop track that features a synth-heavy background. The chorus starts with all five members singing in perfect harmony. The lyrics are about how the group is dealing with breakups. They talk about moving forward and not fretting over the past, and getting over the crying part of the breakup. The pairing of lyrics and vocals really make this song feel so grand and huge. The song expresses a message of empowerment after an end of a relationship, and that’s a message everyone can take to heart when getting through a nasty breakup. 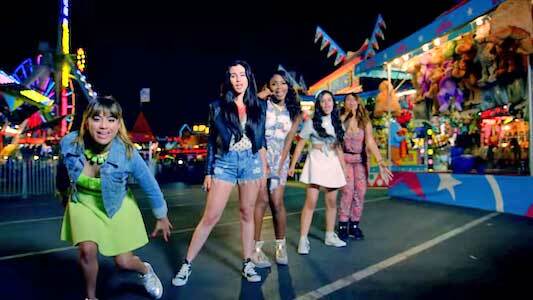 Lauren Jauregui and Camila Cabello wear chucks in the video. The music takes place in San Diego at the Del Mar Fairgrounds where the group starts the night by ridding themselves of reminders of their old flames. The group then spend the night romping around the carnival, playing games, riding rides, and winning prizes. Throughout these scenes at the Fairgrounds, Lauren Jauregui wears black high top chucks and Camila Cabello wears white high top chucks. There are also shots of the group performing the song on what appears to be a soundstage, and extreme close-ups of them. Because of all these different shots, there is a lot of cutting in the video and it can be a bit disorienting. Overall though, the video is a fun companion to the song that highlights the track’s message of getting over a breakup, and just enjoying life. The group belts out a powerful performance in front of some carnival games. Click on the links below to get a new pair of chucks to cheer you up.